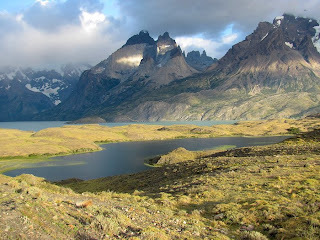 En route from Hosteria las Torres to the boat dock at Pudeto, we stopped to enjoy this view of the peaks of the Paine massif rising over Lago Nordenskjold. In the center are the peaks of the Cuernos del Paine ("Horns of Paine") with the dark-colored tops. Just to the right are the peaks named Hoja ("blade") and Espada ("sword").